After the New Year, I was at the local Border’s, then in the midst of their Going-Out-Of-Business sale, and I picked up Tom Wolfe’s The Right Stuff. I’ve loved the film since I first saw it way back in the day, only I’d never read the book about the early space program and the Mercury Project. Alan Sheppard, Gus Grissom, John Glenn, Gordon Cooper. Names that have gone down in history as the pioneers of the Space Age, men who rode the rockets and truly had the Right Stuff. One name that hasn’t gone down in history? Ham the Chimpanzee. 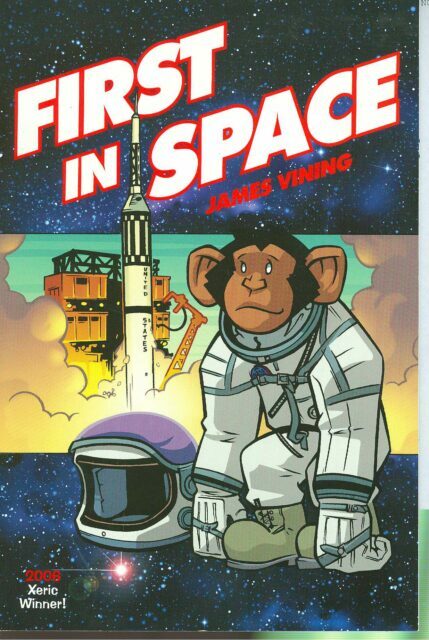 James Vining tells the story of Chop Chop Chang, better known to his handlers as Ham, the first American to ride a Redstone rocket inside a Mercury capsule, in his graphic novel First In Space. The story mostly revolves around Airman Beacham, Ham’s handler, as Ham is put through a training program, much like what’s seen in The Right Stuff — flipping switches inside a spacecraft replica, going through the rigors of a hi-gee centrifuge and isolation chambers, experiencing a rocket sled test in the New Mexico desert. Some of the story is viewed through the eyes of Ham, in particular two dreams that take the reader inside Ham’s mind and show how he understands the training he’s being put through. The graphic novel climaxes, as one might expect, with Ham’s Mercury flight on January 31, 1961. First In Space was a surprisingly touching piece of work. Beacham bonds with Ham (and gives him his name, in defiance of regulations) and demonstrates genuine care for the chimp, another chimp dies in a rocket sled experiment, and the final act of the story — Ham’s flight and its aftermath — convey genuine emotion as the story flashes forward to the end of Ham’s life, caged, forgotten, and dismissed as an historical footnote; those few minutes of weightlessness he experienced at the edge of space may have been the closest he had ever been — and would ever be — to freedom. As time wears inexorably toward the fiftieth anniversary of the first Mercury flights next year, First in Space chronicles a valuable chapter of the story of the Space Race in a way that space nuts of any age — both those born in the age of the Shuttle when space travel has become routine or those born in the heroic days of Mercury, Gemini, and Apollo when the fate of civilization itself rode the rockets — will be able to appreciate.